The opulent San Francisco Plantation House is a galleried house in the Creole manner that has been pictured in American, British, and Swedish periodicals as one of the major sites of the New Orleans area. Constructed between 1849-50, the San Francisco Plantation House is one of the most ornate of Louisiana's plantation houses. San Francisco, with its potpourri of architectural designs, its immense and ornate roof construction, and the paintings decorating the ceilings and door panels in the house's parlors, exemplifies the "steamboat Gothic" style. The exterior of the home resembles a layer cake, with a simple ground floor where brick columns support the gallery across the front and halfway back the sides. A double stairway leads from this gallery to the second floor gallery where fluted wood columns with cast-iron Corinthian capitals support an overhanging deck. The main living area is on the second floor instead of the ground level. The attic is a Victorian construction that gives the house a unique look with the hip roof pierced by tall dormers with diamond-paned, Tudor-arched windows. San Francisco's floor plan is unique as well, but the interior's primary significance lies in the fine murals attributed to Dominique Canova. The cost of San Francisco Plantation House, along with the paintings and other interior decorations, may have given rise to the house's name. One legend holds that the French phrase "son saint-frusquin," or "the shirt off his back," was a description of what the construction of the house cost its first owner, Edmond Marmillion. This became mistranslated into San Francisco. Another legend holds that the name celebrated the port of entry to northern California, then undergoing the gold rush of 1849. A further legend states that the name changed from Sans St. Frusquin to San Francisco when Achille D. Bougere purchased the plantation house in 1879. San Francisco was originally preserved by the efforts of Mr. and Mrs. Clark Thompson. 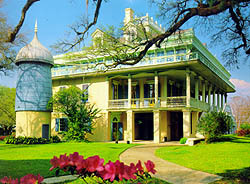 The house is now owned by the San Francisco Plantation Foundation and has been restored to its former glory. San Francisco Plantation House, a National Historic Landmark, is located on Highway 44, off River Road, three miles upriver from Reserve. Fortunately, the house was not damaged by Hurricane Katrina, but please check with them directly to confirm the current hours of operation. The Plantation is open for tours 10:00am to 4:30pm March through October and 10:00am to 4:00pm November through February (except major holidays); there is a fee. Please call 985-535-2341 or thier website for further information.